Hodgdon, The Brand That’s True®, is pleased to announce a new book, The Gunpowder People: The Official Authorized History of Hodgdon Powder Company, by James W. Bequette. Celebrating the 70th Anniversary of the company’s founding, this book covers the history of the Hodgdon family, the founding of the company in 1947, the key employees instrumental in building the company in the last seventy years and many other stories. Born in 1910, founder Bruce “B.E” Hodgdon launched Hodgdon Powder Co. after serving in the military in World War II. Hearing how the U.S. government scrapped surplus gunpowder by the shipload after World War I, Hodgdon took out a loan against a life insurance policy in order to buy surplus 4895 gunpowder in 1947. With an ad in American Rifleman in January 1948, Hodgdon was selling powder to the handloading public. Along with wife Amy and sons J.B. and Bob, Hodgdon built Hodgdon Powder Co. in Shawnee, Kansas into the quintessential American success story. Sons J.B. and Bob (and a long list of passionate Hodgdon employees) grew the company further, establishing Pyrodex in 1976, purchasing competitor IMR in 2003, licensing Winchester Powder in 2005 and purchasing Goex Blackpowder in 2009. 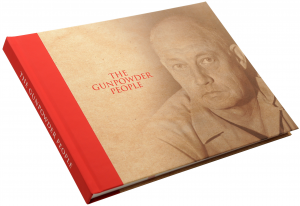 This book is available immediately for $44.95 on the new Hodgdon website at https://www.hodgdon.com/product/2017-gunpowder-people. Established in 1947 by Bruce and Amy Hodgdon, today, sons Bob and JB have grown Hodgdon Powder Company into the largest US supplier of smokeless, blackpowder and blackpowder substitute propellants. The company distributes gunpowder under the Hodgdon®, IMR®, Winchester® and Goex® brands.